Mom has some shredding to do. Yes my humans need to shred too. Perhaps I should go help like you. Maybe you can help shred it? Dante is good at shredding paper. Especially the important papers. I gave you an award my sweetie. Stop by and get it. email me if you do link me, so that I can link you too! This is so amazing - One of our cats shreds, too - never heard of it before we saw Tabby doing it. Check out my blog about a colony of abandoned/feral cats near my home. There will be stories there as time goes on that could inspire and inform anyone you know who wants to help homeless cats. Thanks for the share. It's great to see you helping out with the bills on a lazy Sunday morning. 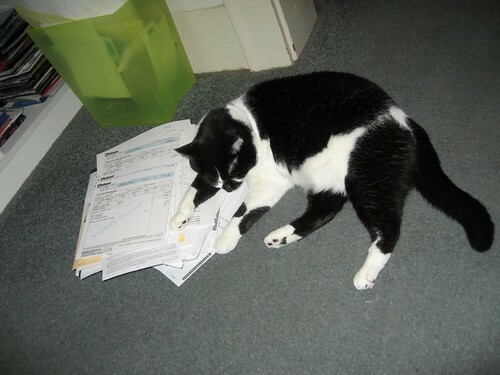 They are probably all your invoices of all the cat toys and treats you received in the past month. Glad to see such a sweet photo. Have a great day.